Fox Five Road Warrior at Legendary Event! Five Segments! Five Departments! What a thrill to have Fox Five’s outstanding Road Warrior Stacey Elgin come and visit A Legendary Event! Our team showed how to have a Legendary holiday with our very own Legendary experts demonstrating what A Legendary Event has to offer for the holiday table. Executive Chef Christophe in the kitchen showcased a fabulous Holiday Cranberry Orange Relish. Executive Pastry Chef Charles Barrett in the Pastry Shop demonstrated how to make our famed Pumpkin Cheesecake Lollipops. Floral Director Jeanna Graham showed how simple food die and seasonal fruit such as crabapples or cranberries can add a simplistic flair to a holiday table. Creative Director Steve Welsh showed his talents by creatively transforming a wood panel from the hardware store into a stunning and spectacular tiger eye patterned wood dining table that made an exquisite fall statement. CEO and founder, award-winning Tony Conway showed us his festive flair by appointing the perfect place setting with colorful table napkins making a scalloped fold that dressed up the table and resembled a memorable Thanksgiving turkey styled design. The Legendary team showed how limitless the possibilities are at A Legendary Event and when you add a personal touch, everyone enjoys the holiday in style. Try one of our recipes and tell us how it turned out! Happy Holidays and may your blessings be many! This entry was posted in Atlanta Caterer, atlanta caterers, atlanta catering company, Charles Barrett, entertaining, Executive Chef Christophe Holmes, jeanna graham, Steve Welsh, Tony Conway. Bookmark the permalink. We have been busy elves here at Legendary Events during the 2009 holiday season and have been fortunate enough to have many events on our December calendar. One of the exciting design and floral events that we produced on the 1st of December was a Client Appreciation Party for the St. Regis. The St. Regis Astor Ballroom is gorgeous with its ivory painted mill work, custom chandeliers, silk embroidered fabric walls and the silver leaf ceiling. This architecture makes our job easier (and harder); while we have great bones to work with, we have a high standard to live up to. The ballroom was draped off into 6 sections with gorgeous sheer white fabric. The focus of the space was placed in the center of the room under the magnificent hand made crystal chandelier. A tree full of holiday red berries was created by our floral director, Jeanna Graham and our infamous creative director, Steve Welsh. 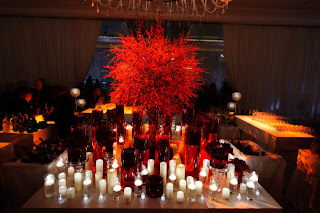 Surrounding the tree were over 50 glass containers filled with berries, amaryllis, ruby water and, of course, candles. 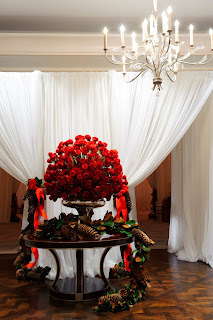 The entrance to the ballroom was draped with sheer white fabric then tied back with magnolia leaf and large sweet pine cone garland and finished with a luscious red ribbon. A large silver urn filled with over 300 red roses sat on this gorgeous mahogany table. The entrance alone was enough to take your breath away!! Overall, this turned out to be a wonderful and gorgeous evening!! This entry was posted in A Legendary Event, jeanna graham, st. regis, Steve Welsh, Tony Conway. Bookmark the permalink. The following night at the Ritz Carlton in Buckhead, The Shepherd Center Foundation celebrated their annual “Legendary Party” under the direction of Gala Chair Cyndae Arrendale. 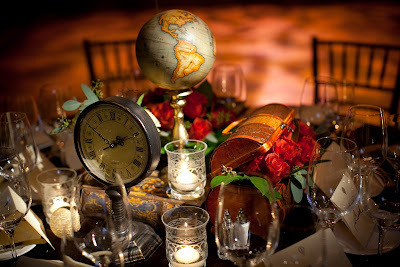 This year, the theme was “Around the World in Eighty Days.” After the 450 guests received their “passports,” they crossed a large wooden boardwalk and were greeted by Phileas Fogg and other characters straight from the pages of the Jules Verne classic. This entry was posted in A Legendary Event, a meal to remember, cyndae arrendale, jeanna graham, ritz carlton, senior citizens of metropolitan atlanta, shepherd center, st. regis, Tony Conway. Bookmark the permalink.